One of Gainax’s abandoned film projects on the side of the road. The early days of Gainax as a studio from some of the most endearing stories of a bunch of ragtag but highly skilled anime fans trying to become professions. From the DAICON III and IV Opening Animations, to being granted a near unlimited budget for crafting Royal Space Force: The Wings of Honneamise, and even a Names Changed To Protect The Innocent style pseudo-documentary on themselves via Otaku no Video, there are a lot of swell industry stories. In between all that though, things were also quite murky for a while. If one does even a cursory glance into the studio’s output over the years, the early half of the 1990’s can look like quite a mess before the last ditch effort of Neon Genesis Evangelion steadied the ship. Some small OVA’s like Money Wars and Blazing Transfer Student, and while Nadia: The Secret of Blue Water was popular and well received Gainax did not own the rights. They had lost tens of millions of yen assembling it. During this time several film projects were floated around, perhaps the most famous of which is the on again off again Aoki Uru, a sequel to Honneamise (which has in recent times switched back into “on” mode). But, there were also other casualties. 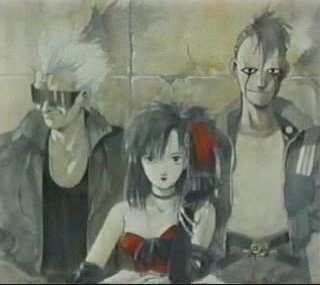 The 1991 pilot film for Route 20: Galactic Airport predates the attempts for Aoki Uru by barely a year, and in turn was intended to be Gainax’s second major theatrical piece. Just as before, this has all the trappings of being an ambitious work. Set to the sounds of howling wind, then “The Crystal Ship” by psychedelic rock band The Doors, we see a combination of static illustrations and animated sequences of a dystopian technofuture. A walled city adorned with monitors and and protected by robotic police enforcers. Scenes of extravagant wealth, of elegant gowns, well mannered bars, and television monitor butlers not too dissimilar from who we would later call Canti in FLCL. Inversely, so too do we see shots of urban squalor, punk infused gangs, and the all around lower rungs of a depressed underclass in serious disrepair. One of our leads would have been a low end of society male android (or at minimum someone with a serious amount of mechanical implants; one of the animated bits of the pilot is a look into his whirring torso). Mixed up with them, a red dressed young woman woman either from the higher levels of society herself or merely allowed to operate within them in some limited capacity. Scenes of futuristic motorcycle chases, police action, and longing together on snow filled nights hoping for something more. The titular galactic airport both ever present as an achievement to development and commerce, and a seemingly impossible destination to travel upon for many below. In processing the aesthetic of what Yoshiyuki Sadamoto and Mahiro Maeda cooked up here (they each explicitly share screenwriting and directing credits on the pilot, while Sadamoto is also the character designer) it immediately calls to mind several titles. Some of which would not come for many years later. The general setup is like an inversion or dour extension of the hope for outer space expressed at the conclusion of Honneamise, with so many left lost and unfulfilled in the wake of the industrial push for the stars. Technology and punk styles meeting with a dose of hot bikes calls to mind Akira as a natural reflex. Beyond that, with the higher levels of societal structure evoking a sense of nostalgia for the high class of decades pass, one may recall classic movies such as Metropolis or indeed even much later shows like The Big O. The general color palette of Sadamoto illustrations makes me consider what Yoshitoshi ABe would on on to whip up for Serial Experiments Lain by the end of the decade. 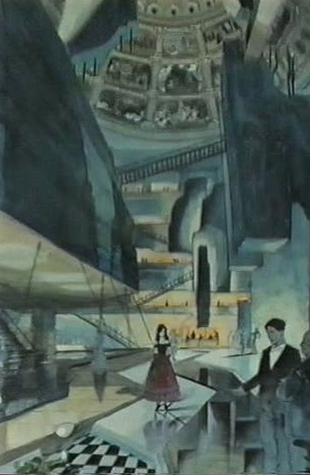 Elsewhere, aspects of the still in the future but slightly more contemporary Batman: The Animated Series. 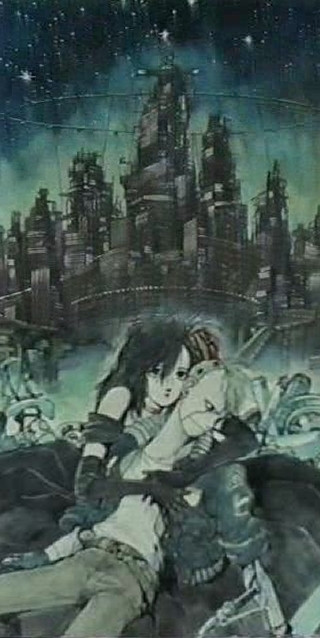 Sadamoto would go on to release a small manga entitled Route 20: The Town With Gears, but as far as the pilot film is concerned it is only a spiritual salvage job. Many of the characters have been redesigned, aged down closer to young teen levels, and so on. It is more upbeat or all around active, dealing more in Youth Rebelling Against The Man, compared to what looks to have been a much more somber production at the start. “The Crystal Ship,” while I would be shocked to ever learn Gainax had proper legal rights to use in the pilot film, is nonetheless a swell song to accompany scenes of quiet metropolitan despair. As the story goes, it was inspired by an offshore oil rig in the night sky. If the original pilot film pitch wanted investors to latch on more to rambunctious young uprisings, such indications would be been more prominent in the roughly three minutes of material we do have. So I chalk up the manga as an interesting side product to make limited streamlined use of select existing materials, but not what the movie was reaching for. It is also important to keep in mind it is entirely possible the film as it may have been intended would have bombed. Financially, Japan was at the start of a long economic recovery cycle after their 1980’s bubble burst, so investor and consumer spending would be down. A dangerous prospect, given how long it took money to be made back from Honneamise when the system was a lot rosier. Critically, things are harder to say given that there is so little of the project to judge. I do feel it would have been naturally questioned as being something of an Akira knockoff however, intentionally or not, given some surface level similarities of punk gangs, bikes, and government. Given the impact and high regard Akira has even into the present, this may have led to a number of unfair comparisons. Which, if a significant amount of capital in an already financially unstable company would be at stake, it may well have merely proven to be the wrong place at the wrong time. This all being said, the Route 20: Galactic Airport pilot film does accomplish one of its main goals. Based on these three minutes, I can say yes, I would like to see this as a larger movie. I get a sense of its world, its troubles, its people, and I can see a vein of rich stories to tell within that space. I see its visual style, and it encompasses bits and pieces of elements I have enjoyed and even praised over the years. I would not have been able to help this film back in 1991. I still would not be able to help it now, outside of acknowledging its existence. There is something of a sentiment running through the pilot of if the romantic angle of our two leads would be doomed or not. Perhaps, maybe, social acknowledgment would help them on their way.